My team and I are dashing off to High Point this week, but before we head there I wanted to share a dining room and butler’s pantry Before and After. We’ve been working on this large Main Line home for a few years now, designing it room by room! You can read more about the bold library we designed in this blog post here: Before and After - Teal Blue Library. A little yellow, a little lackluster, but the room has great bones. Look at the original chandelier and the height of the ceilings and windows! And of course, we’ll be zhushing up those classic chippendale chairs. Bright fuschia accents are stunning against a backdrop of dramatically dark walls, trim, and mantle. The Scalamandre roman shades and brass bar cart (far corner) complement the traditional chandelier, wingback chairs, and this elegant gilded mirror. Professional tip: The most economical way to refresh a space is by adding a dramatic paint color. We gave these chairs a lot of love by reupholstering the seats in a rich fuschia velvet. 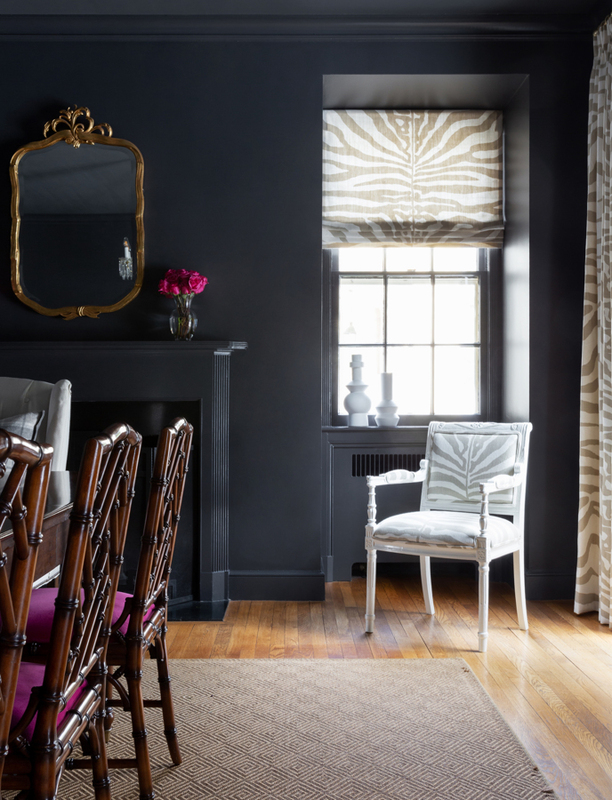 The sophisticated Scalamandre shades, drapery, and chair introduce a touch of modern-day chic that still speaks to the traditional architecture of the house. 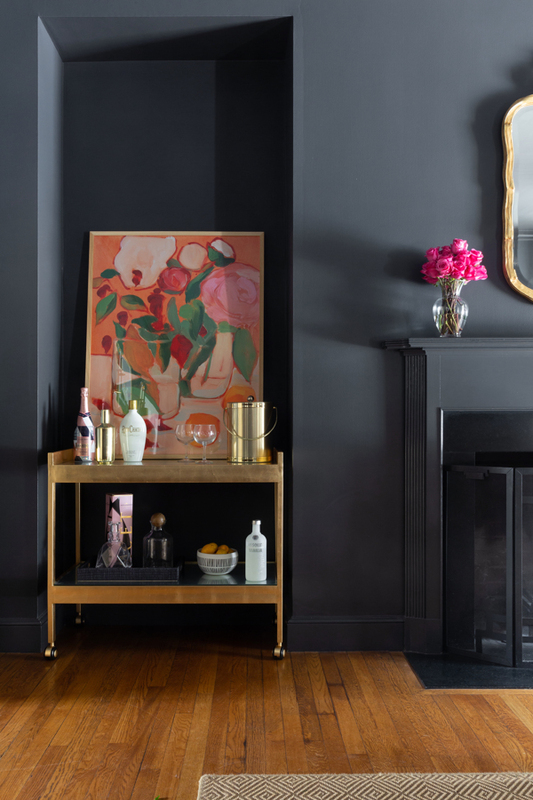 Every dining room needs a bar cart! We chose this simple cart in brushed brass to complement the gilded mirror and other touches of brass throughout the space. It was the perfect setup to place in this little nook. Meanwhile, the abstract floral painting brings the whole design together with bold color and a modern feel. Pour us a drink, and we’ll stay here forever! Just kidding, AW! We redesigned this dual-function butler’s pantry and office next. The dimensions of this space posed the greatest challenge. Narrow spaces can end up looking dark and dreary if you’re not careful. A great space, beautiful original cabinets, but in need of a serious refresh. We also wanted a stylish new space for this adorable cutie to stash his candy! The traditional Le Touches wallpaper creates movement in the space without feeling too busy, and the ebony roman shade makes the white of the wallcovering pop even more. Fresh, bright and fun -- mission accomplished. That pendant is one of our favorites, too. Selecting frosted glass hides dirt... which is important when you have 9½ foot ceilings! These cabinets are original to the house, and options for desk chairs that would fit were abysmal. So we chose a structured jute pouf. It doesn't take up much space and can easily be stored underneath when our client isn't working. Plus, it ties in the freshly oiled butcher block countertops and adds much needed texture to the room. Greenery, greenery, greenery. It’s so important when styling your space. This is the perfect spot for my client to create flower arrangements prior to dinner parties and holiday entertaining. That’s it for now, but make sure to follow along with our Instagram stories over the next week — I’ll be posting all my fabulous finds from High Point there. And don't forget to subscribe to our blog/newsletter, or you’ll miss our High Point Trend Report coming later this month! In the meantime, thank you so much for being a part of our design journey. We love having you in our tribe — it means the world to us! Whew! Talk about an insane week in High Point! We returned from the market hardly a week ago, and we’re still recovering from three long days of nonstop browsing, talking, Instagramming (is that a verb? ), workshopping, and browsing some more. It was exhausting but AMAZING. Alright, let’s take a look at some of these beauties! This is what heaven must look like. I fell in love with not one, but TWO chairs with caning. Look how sophisticated and tasteful caning is. There’s no other word for it… it’s a timeless classic. Indoor or out, this chair is simply divine. Doesn’t it call out to you with promises of rest and relaxation? That’s a call I’ll happily answer. I came. I saw. I purchased! Keep your eyes peeled for this beautiful bar stool in one of our upcoming design reveals. 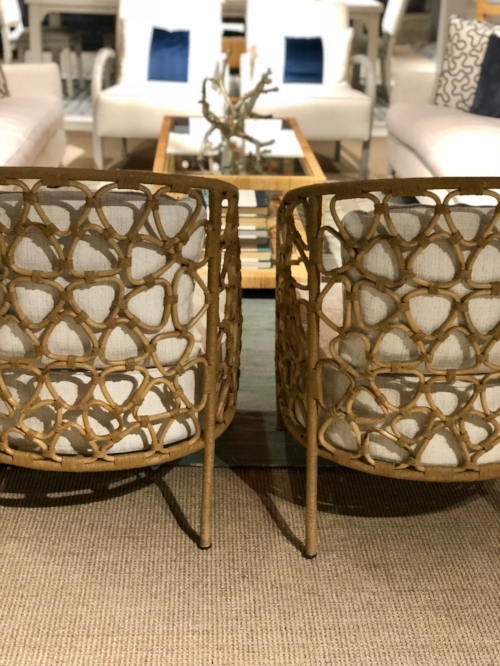 The backs of these chairs… creative, classy, coastal. Need I say more? Whoa! 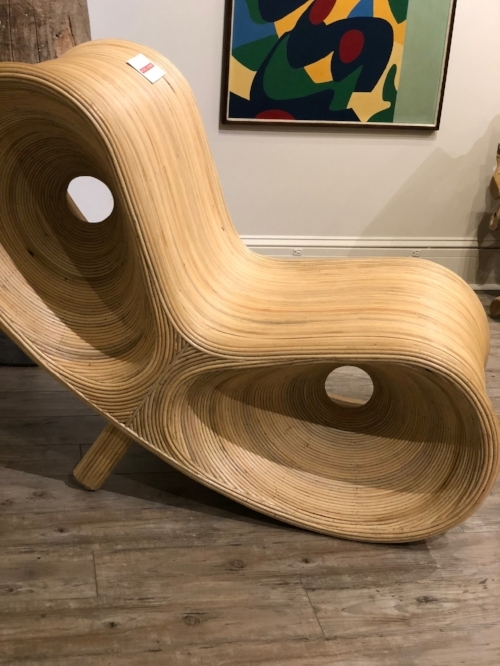 This stunning chair stole the show in its little corner of High Point Market. I can’t vouch for comfort, but it is undoubtedly fab! I love effortless details, like the grain in this burl wood. When natural materials have a character of their own, it can elevate the whole design. Yes, please. There is something about the back of this chair that leaves me speechless. Some beauty can’t be described in words. Just take a moment to admire this one for me, please. This chair completely took me by surprise. When the seat fabric doesn’t match the chair fabric, I usually cringe… but this one I’m actually on board with! Elegantly done. This chair reminds me a bit of a French macaroon: delicate, layered, and oh so pretty. This stunner had my mind going crazy with design ideas. 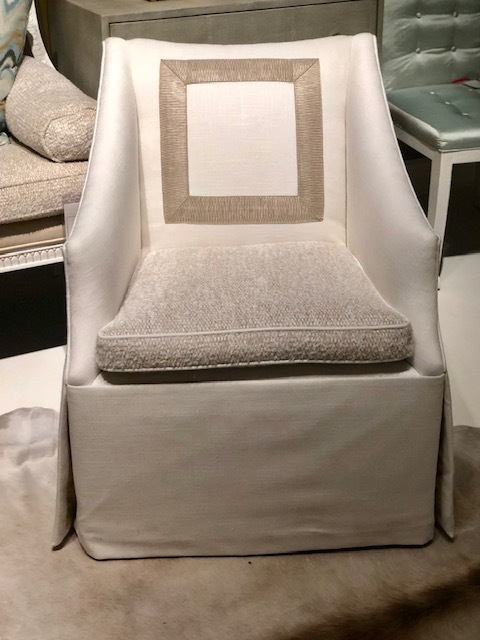 Picture this chair in a suave gentleman’s den, a home library, or let it star in a bright white living room. See? There’s no bad situation! The subtly curving wood beads are beautiful on this lamp, but the whole scene is a work of art too. Textured neutrals are my jam. Enter, beautiful black beaded chandelier, and I think I’m in love. 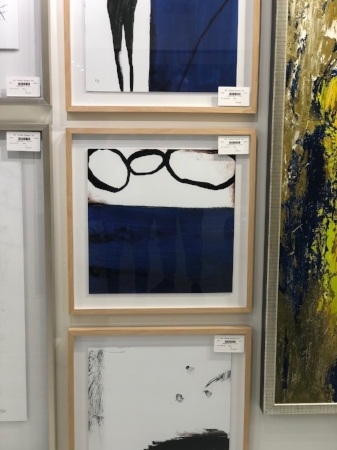 Can you picture this in an all-white room?? Two words: Show. Stopper. You may have noticed a wood-inspired theme with most of these picks so far. This dome pendant is the last one, so enjoy it! 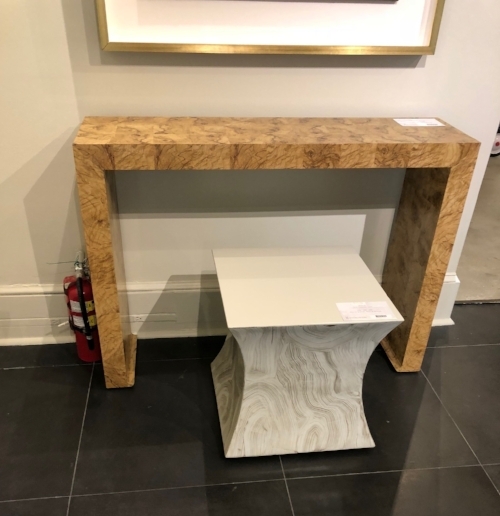 I love how the design mixes a glamorous polished nickel with the wood’s casual feel. Fun but classy. These beautiful galleries caught my eyes as soon as I passed them. Black and white + moody blues + touches of gold = right up my alley! You know me. This feathery plant is called pampas grass and was EVERYWHERE at High Point Market this fall. I love the whimsical touch it adds to a space. Another scene that words won’t do justice. Just observe. Everything about this is Yes. I love it when the process of making the design becomes part of the design. 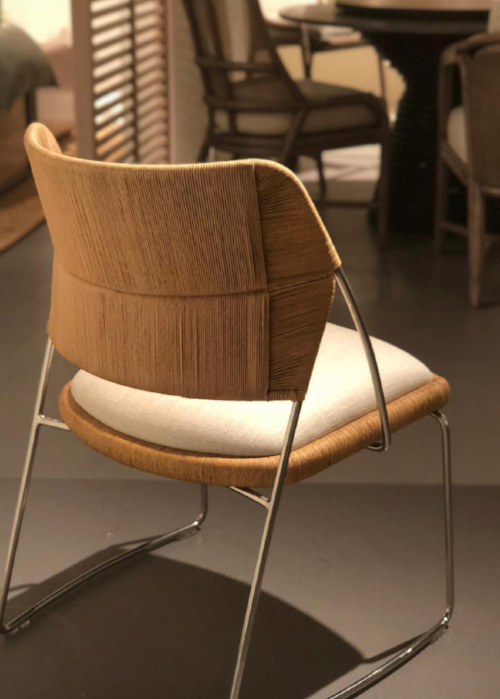 The stitching on this chair is beautiful — as a design element on its own and as an ode to its craftsman! More trim details that I just love. There’s something about a dark trim on a light piece of furniture that looks so clean and classic. I saw quite a bit of this style at the market. Top notch. Alright, that’s it for my finds from this year — thanks for journeying through these with me! I know it’s difficult, but if you had to pick one, which is your favorite? ?